In New Jersey’s southernmost district, Assembly incumbents from different parties are hoping to win reelection and, with their running mates, take control of the 1st District. In the neighboring 3rd District, a powerful longtime incumbent and an up-and-coming former football player are hoping to fend off two relatively unseasoned Republicans and a liberal-leaning independent. Both Assembly seats are up for re-election. The top two vote-getters win. One of only a handful of battlegrounds in the state, this district has one of New Jersey’s lowest median incomes. A seasoned Democratic senator, who is not on the ballot, leads the district, but neither the Assembly incumbents nor their running mates bring much political experience to the race. 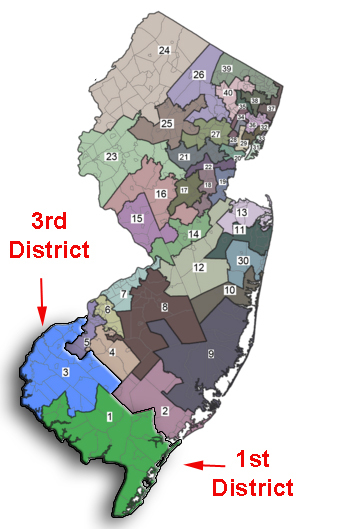 Encompassing Cape May County and parts of Cumberland and Atlantic counties, District 1 is one of only two districts that splits its Assembly seats. Sensing an opportunity to sweep the election, the national General Majority PAC is pouring in money to support the Democrats, but so far, the money doesn’t seem to be swaying the public in any particular direction. A mid-October poll conducted by Stockton University found that all four candidates are running within three points of one another. This comes as little surprise in a district where both incumbents are chasing their second full term, and voters have spent most of this century electing both Republicans and Democrats to state and national office. Bob Andrzejczak, a 29-year old Democrat, captured first place in the poll, with 25 percent of the likely vote. Andrzejczak is a former Army sergeant who received a Purple Heart — among other medals — for his service in Iraq, where he lost his leg in a convoy attack. He claims the most political experience among the candidates, having been appointed to fill a vacant Assembly seat in March 2013, winning it outright later that year, and chairing an Assembly committee in his first full term. Andrzejczak’s Democratic running mate, Vietnam War veteran Bruce Land, has held a civil-service position as a captain for the Department of Corrections (DOC) but has never held public office. He placed second in the poll, with 23 percent of the likely vote. Their opponents, incumbent Republican Sam Fiocchi and two-time Cumberland County Republican freeholder Jim Sauro, trail slightly at 22 percent each. Both Fiocchi and Sauro have spent decades running their own companies and frequently attack their opponents for lacking business experience. Although Land, one of the Democrats, is a point ahead of incumbent Republican Fiocchi, conventional wisdom would have Democrat Andrzejczak and Fiocchi returning to the Assembly. Elections favor incumbents in off-years and voters don’t get much chance to get to know non-incumbent candidates. Many of the bills Assemblyman Fiocchi has sponsored are commendations or special designations, leading the South Jersey Times to call his term “unimpressive” and to endorse Sauro, his Republican running mate, along with Andrzejczak. The paper’s editorial board notes that the Fiocchi doesn’t have much of a relationship with his district teammates and suggests that Sauro’s “more outgoing personality” may help him play better with Van Drew and Andrzejczak. The district’s voting history is fickle, and lawmakers from both parties tend to straddle the political middle. Some consider Van Drew the Senate’s most conservative Democrat. The region’s congressman, Frank LoBiondo, has won successive terms as a moderate Republican. Andrzejczak and Land’s anti-tax and regulatory views land them in traditionally Republican territory. Registered Republican voters outnumber Democrats by approximately 6,000, and Republicans governed the district almost exclusively for at least 30 years before electing Van Drew to the Assembly in 2001. Later, Democrats reigned from 2008 until Fiocchi’s entrance in 2014, though Republicans lost those intervening races by tiny margins. On the other hand, Fiocchi won in the year Gov. Christie swept easily into his second term and it is unclear if he will be able to win on his own this year. Voters in this struggling agricultural district tend to base their vote primarily on the economic policies promised by candidates, regardless of party. The Stockton poll found they rate taxes as their top issue, followed closely by jobs and the economy. Their economic woes have deepened considerably over the past five years: against a backdrop of previously shuttered manufacturing and food-processing plants, constituents here have suffered through the recession, Atlantic City casino closures, and Delaware Bayside devastation from superstorm Sandy that received a mere fraction of attention and money from the state. Although candidates are listing economic recovery at the top of their priority lists, they and their proxies are spending precious time slinging mud at one another instead. The Democratic General Majority PAC is running commercials accusing Fiocchi of paying his business taxes late, a refrain echoed by Andrzejczak. “They’re saying they’re doing a great job with their businesses but something as simple as mailing your check in — they can’t even manage to do that,” he said. Together with Assembly Republican leader Jon Bramnick (R-Union), who’s stumping for the South Jersey Republicans, Fiocchi and Sauro ridicule their opponents for having no business experience. They also accuse their party allies in Trenton of mismanaging state finances and bearing responsibility for a declining manufacturing sector and high rates of unemployment, taxes, and spending. “Andrzejczak and Land represent a failed status quo that has cost South Jersey thousands of good-paying jobs and driven our taxes through the roof with nothing to show for it,” reads a press release distributed by the campaign. Issue-based differences between the candidates are hard to find. All four candidates favor job-creation initiatives and projects like corporate tax incentives, with both incumbents claiming responsibility for securing special credits for South Jersey. The four candidates profess a passion for expanding the manufacturing sector, particularly by establishing county college and vocational-technical school programs that train for manufacturing jobs in local demand. Last year, Fiocchi introduced a package of five bills designed to bolster manufacturing in his district. His bills proposed to lower the job creation requirements for Economic Development Authority (EDA) incentives and loosen the requirements for Asian companies relocating to New Jersey; eliminate sales taxes on utilities for certain manufacturers; and delay applying new regulations to incoming New Jersey manufacturing companies for 10 years. Last on the list was a bill to set up a construction workforce recruitment and training website. Sauro’s campaign biography describes the master plumber who studied at four South Jersey vocational schools and community colleges after graduating from high school in 1972 as a “fierce advocate” for a full-time vo-tech high school in Cumberland County. However, when freeholders approved the construction of such a school, Sauro balked because he said it would cost significantly more than expanding the existing part-time facility. Andrzejczak lists on his website, that he has been “building bridges between education and industry.” Andrzejczak said he believes South Jersey should foster job growth by cultivating a new aquaculture industry for the breeding, rearing, and harvesting of plants and animals in all types of water environments. 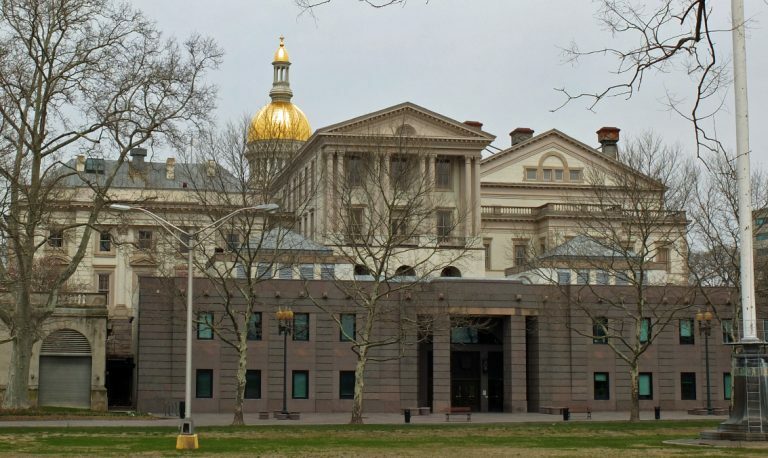 “The potential for growth is amazing,” said Andrzejczak, who chairs the Assembly Agriculture and Natural Resources Committee, lamenting that New Jersey’s onerous regulations leave it trailing other Mid-Atlantic states. Andrzejczak also sits on the Military and Veterans’ Affairs Committee and the Intergovernmental Relations Commission. The retired army sergeant did two tours in Iraq that spanned 17 months and received a Bronze Star, Purple Heart, and six additional commendations for his service as an infantryman. A married father from Middle Township, he was discharged in 2010. Land received a Bronze Star for his role as a sergeant in the Vietnam War, then spent his career as a DOC captain. The married retiree lives in Vineland, where he coaches several youth sports teams and is a member of a few community organizations. 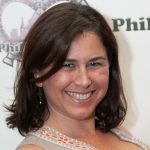 New Jersey ELEC records show the Democrats have outraised and outspent their opponents more than 3-to-1. Together, as of October 2, Andrzejczak and Land had raised about $800,000 and spent all but $4,000 of it as of October 23. The Republicans raised $245,000 and spent $204,000. Fiocchi served one term as a Cumberland County freeholder and spent nearly 40 years running his family’s agricultural company before heading to Trenton, where he sits on the human services, regulatory oversight and telecommunications and utilities committees. He’s a past president and board member of the New Jersey Irrigation Association and was awarded the NAACP’s Political Courage Award in 2011. The married grandfather was born and raised in Vineland. Sauro spent one year as freeholder director in the early 2000s then returned to the board for his current term more than 10 years later. As owner of two Vineland plumbing, heating, and water-treatment companies, Sauro was the former legislative chairman for the New Jersey State League of Master Plumbers. He lives in Vineland with his wife and three children. Powerful Democratic Assemblyman John Burzichelli is seeking his eighth term representing South Jersey’s District 3, home to Senate President and possible Democratic gubernatorial candidate Stephen Sweeney. He’s running with popular football pro-turned politician Adam Taliaferro, who was appointed in January to replace Celeste Riley when she left to take another job. They face off against independent John Kalnas and two Republicans, Woolwich mayor Samuel Maccarone Jr. and Leroy Pierce, a director of a firefighter academy. If Pierce were to win, he would be the first Salem County resident elected to the General Assembly in more than 10 years, even though the district covers all of Salem County, some of Gloucester County and a small piece of Cumberland County. The other candidates all live in Gloucester County, the political seat of the district and by far the most populous and suburban county in the otherwise agricultural region. It’s considered a Democratic stronghold, though registered Democrats only account for just a third of the electorate. However, in a district where almost half of registered voters consider themselves unaffiliated, Democrats hold a 2-1 advantage over Republicans. There’s been no polling done this election cycle, though it would seem the Democrats are the more likely contenders. Burzichelli served 15 years as mayor of Paulsboro and now holds legislative leadership positions as Deputy Speaker, chair of the Appropriations Committee and vice chair of the Budget Committee. He is also a member of the Tourism, Gaming and the Arts and Joint Budget Oversight committees, and member of the Legislative Services Commission. Taliaferro garnered a following – and had a book written about him — when he made a remarkable recovery from a paralyzing spinal cord injury he sustained while playing football for Penn State University. He went on to study law at Rutgers-Camden and become a practicing lawyer. Since then, the married Woolwich Township father started a foundation to help spinal-cord injury patients, joined the Penn State board of Trustees, won the Philadelphia Sports Writers Association “Humanitarian Award” and got elected a Gloucester County freeholder. Maccarone, a former corrections officer who lost his arm in an on-duty accident, served as vice president of the County Correctional Officer Association and governs one of the fastest-growing communities in the state. He’s campaigning on the issues of tax relief and school-funding reform. Pierce is a a member of the Pennsville’s Board of Education and echoes Maccarone’s call for revising the school-funding formula and considers the state’s “affordability” to be of primary concern. Pierce also serves as the director of the Salem County Fire Academy, the married father has worked as a police officer and volunteer first responder. Kalnas associates with The People’s Voice party. According to his answers to a political questionnaire, he is concerned about the exploitation of immigrants, mental health issues, and a strong middle class.